Imbolc Festival milking of the goat. Meet at 2pm on Sunday 2nd February 2014 in Dempsey’s Pub Car Park, Cadamstown, County Offaly. Imbolc Festival marks the beginning of Spring. It is most commonly held on 31 January–1 February. It is one of the four Celtic seasonal festivals. The others are Bealtane, Lughnasadh and Samhain. The Imbolc Festival was revived by The Slieve Bloom Association in 2013. There are many customs associated with Imbolc festival. The custom associated with Slieve Bloom is the milking of the goat. This year is The Slieve Bloom Association’s second year of reviving the Festival. Meet at 2pm on Sunday 2nd February 2014 in Dempsey’s Pub Car Park, Cadamstown, County Offaly. Come along, hear old stories and traditions. 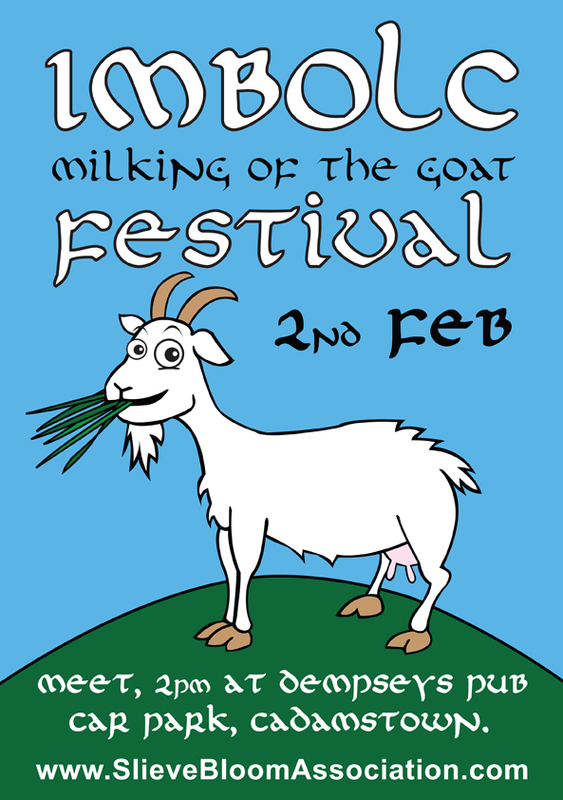 Watch or take part in the ancient Imbolc Festival of the milking of the goat on Spink Hill and maybe churn the milk afterwards. No kidding!